Painting “Two Brothers in their Florida Panther Jerseys” Family Portrait Painting was an exciting and joyful experience for all. These adorable brothers, different as night and day, enjoyed actively playing in their backyard. This scenario made for a colorful, happy, wonderful painting. The inside of my clients home was also very colorful which gave you a sense of the outdoors. Since there were accent colors of green, red, and blue running through their home, a request for fabric samples was made in order for the painting to blend into their existing decor. This pastel painting resulted in a vibrant realistic portrait that to came to life. 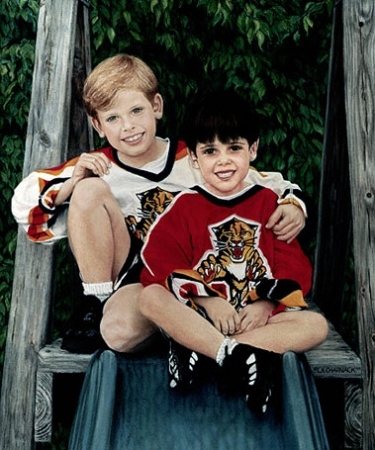 Both Brothers went to all the Florida Panther Games and from little boys played hockey and traveled with their teams. The closeness the “Two Brothers in their Florida Panther Jerseys” Family Portrait Painting felt about each other is evident in their wonderful smiles and natural relaxed loving pose.